Actually Airtel has withdrawn all their unlimited plans except 256 kbps and 384 kbps. So, now there is no way to get 512 kbps or 1 mbps unlimited plan. That too these 256 kbps and 384 kbps unlimited plans cost Rs 100 and Rs 200 more than their earlier price respectively.. Earlier 256 kbps plan was available at Rs. 799 and now the same plan costs Rs. 899, whereas the 384 kbps plan was available for Rs. 999 earlier, now costs Rs. 1199. Wait not only these Airtel has introduced something called as Fair Use policy. If you check their unlimited tariff plan you will notice a statement which says that "Speed subject to Airtel Fair Usage policy". Now lot of people in forums has started complaining that, somehow they are getting only half of the promised speed. Looks like Airtel has applied some up limit to the download/upload size, upon reaching which they will start limiting your download/upload speed. From forums posts it looks like the limit is 15 GB for 256 kbps users and 25 GB for the 384 kbps users. Ironically there is no link to the "Fair Usage Policy" in Airtel website. Oh my Bad, I have paid 2 months advance rent to Airtel. Clearly this policy is a violation of guidelines provided by TRAI. Hopefully someone will complain about this to TRAI and fix this. Or at-least lets hope that other players will not start something like this..
Competition is good, and lets hope that tough competition makes Airtel to change their policy. P.S. : Karnataka goverment may be the culprit for this. Check this news which says heavy tax introduced by Karnataka goverment for ISPs. Actually Airtel appealed against this in High court, and just few days ago Airtel lost this case in High Court. It think this is only fair… why should I pay for others download craze! Yeah.. What you said is right.. This is way better than canceling unlimited plans all together..
@Amber... you'll be paying the same or even more so you don't get any better deal... but those who actually 'use' the net unlike some will have things to worry and be angry about. I'm completely outraged about this stupid FUP. To show my anger, this is what I've done. The content of the mail is here - I blogged about it, so that others may know too. If someone asks you how this FUP is really affecting anyone, use this example to clear all doubts. 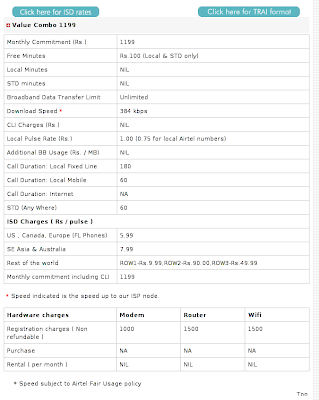 And, here's what Airtel's Speed Rationalization *really* means! Spread the word - Airtel better not get their success to their heads. Collectively we can bring them down to a level they deserve. I was recently alerted to the Fair Use Policy that’s been snuck on us by Airtel and Tata. All these websites have one thing in common. They criticize Tata and Airtel. They also have complaints from users, all conveniently blocked. At this time, I got suspicious, so I used an Anonymizer site, and Lo-Behold!! THE SITES ALL OPENED!! TATA INDICOM BROADBAND (MUMBAI) IS BLOCKING SITES!! So, my fellow MS users... WHAT DO WE DO? This is not just illegal, they are STOPPING US FROm our RIGHT TO FREE SPEECH. RIGHT TO INFORMATION!! Who knows what they’ll do tomorrow if we let them?